Here is a side view of the heel on a Foot MRI showing the plantar fascia attaching under the heel bone and the fat pad under the heel bone with the achilles tendon attaching into the back of the heel bone (calcaneus). 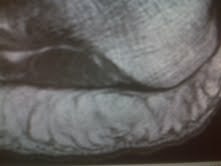 This is a closer image of the same area with a typical thickness of the plantar fascia (a dark black line attaching into and under the heel). 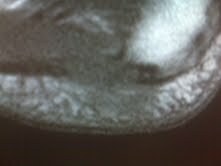 The fat pad is normally very white and thick under the heel bone. The muscles begin to show up to the left of the plantar fascial attachment into the heel and always above the plantar fascia. After seeing what the normal plantar fascia should look like here is my patient Kate with her plantar fascia torn at the attachment into the heel. If you try to follow the black line from the arch where the fascia looks normal towards the heel (to the right), you can see that there is disruption of the black line. The thin black line attaching into the heel is replaced with grayish thick scar tissue. The scar tissue and plantar heel swelling extends downward through the fat layer (where it does not belong) to the plantar skin (at the bottom of your foot. 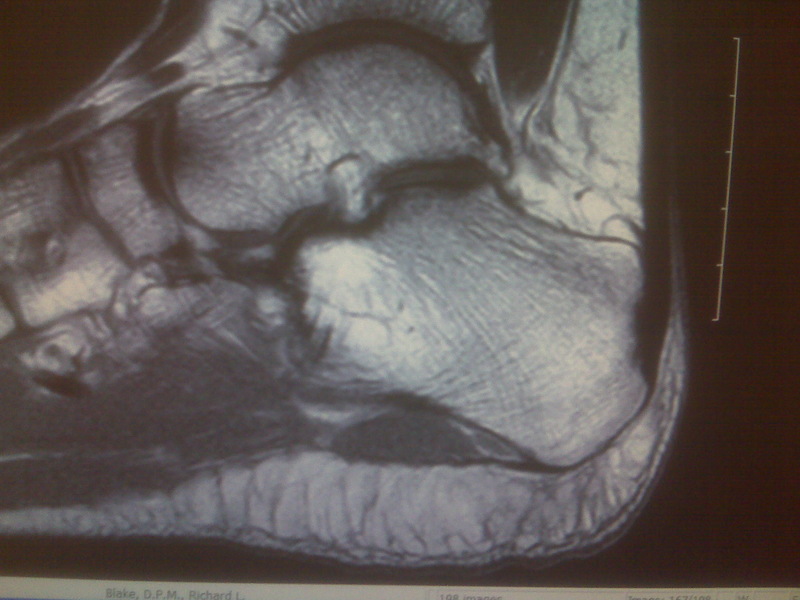 Just looking at this MRI image and you can tell Kate is in alot of pain. 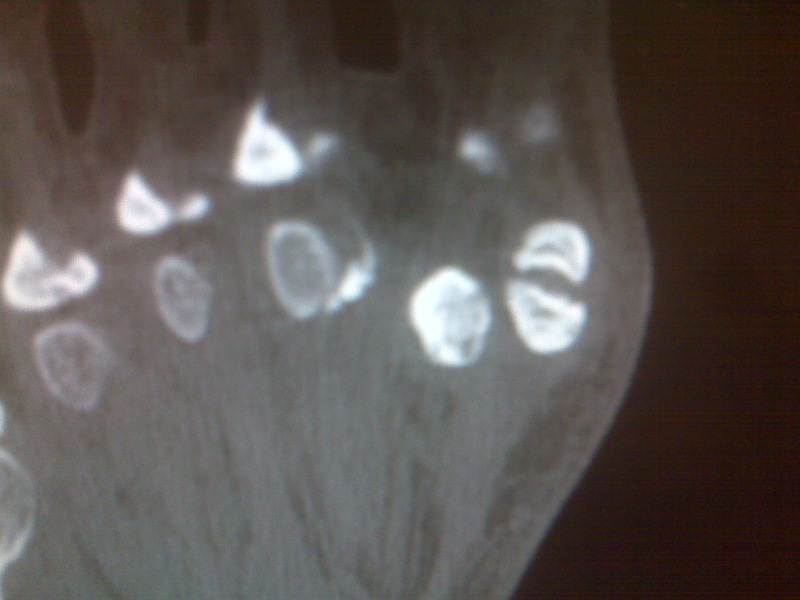 Here is another closer look at the damage produced by this tear on an image closer to the skin on the arch side of the foot. You can see the black line gone over a section from just in front of the heel to an inch or so to the left (into the arch). Kate never felt the tear, and just thought she had very bad plantar fasciitis. 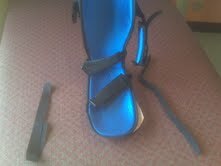 You can only really treat this one way initially, 3 monthes in a removable cast to limit the bend at the toes. After the casting, and only when you are comfortable walking, you can begin to wean out of the cast into some form of supportive orthotic devices to support the arch. Most patients need alot of physical therapy with deep tissue work to break down the scar tissue which always over does it. While you are in the cast, you can do pain free activities (biking, ellyptical as it calms down, some swimming, etc), icing, stretching (pain free), and foot strengthening (crucial, but must be pain free). Here are a copy of links that tie into to this article. Patients, with or without orthotic devices, should never feel that they do not have hope at a soft comfortable impact against the ground. There are so many products out there for dampening shock, and these products are used in many imaginative ways. Here 3 commonly utilized products for shock absorption are demonstated: gel, spenco, and plastazote. They definitely should be part of every shoe/orthotic program, at least in some form or another. I am showing here how I commonly use these 3 products, but there are many acceptable variations. The goal is that the patient feels supportive, but cushioned. Too much cushion however can make a patient more unstable, so there must be a good balance between cushion and stability. One of the most important aspects of designing a good orthotic device is shock absorption. Here adhesive back gel sheets are attached to the heel area of orthotics to help with shock absorption while utilizing a plastic orthotic device for maximal stability. Normally 1/8inch gel is utilized, but up to 1/4inch can be used. Spenco is the best shock absorption material as an insert or orthotic cover. Here, a knockoff spenco, is being used. The original Spenco is still the best and is always in green. 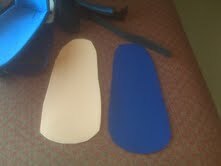 Pink, or #1, plastazote is the memory foam used as the top layer in a Hannaford custom made orthotic device. Here it used as a forefoot extension on an orthotic device in 1/4". I commonly use 1/8" as a full length top cover on an orthotic device. Ice massage is a necessary part of athletic injuries. Remember RICE treatment for acute injuries: Rest, Ice, Compression, and Elevation. Ice application or soaking is a normal part of the acute and chronic injuries. Ice reduces inflammation, relaxes muscle spasms, improves range of motion by decreasing the swelling in tissue, and acts as an anesthetic to desensitize an area. Many of my patients are icing for months and months with their injuries. Please refer below to one of my original posts on the role of ice (especially concerning ice massage). Today I want to introduce a product which helps in the ice massage part of this treatment. For injuries which are fairly superficial, and involving a small area, ice massage for 5 minutes 2 or 3 times daily can be the best treatment. The Cryocup makes ice massage easier than trying to hold on to an ice cube, and more environmentally sound than using styrafoam or dixie cups to hold the ice. Cryocup is 2 cups in one to initially be filled with water and then frozen. One of the secrets of separating the 2 cups is to run the junction of the cups under warm water for 10 seconds or so. When the cups are separated, you can easily hold on to the cup (instead of the ice) and ice the injured area(s). Blister forming while cross country skiing is shown to the right. One of my patients Michelle says she prevents blisters which use to plague her terribly with the use of Body Glide before long hikes or ski treks. She gets hers at REI and the link is above. This is a preventative measure. Please read my blog post on treatment of blisters. This is my last post for awhile on the Hannaford Orthotic Device. It definitely changed my practice of podiatry, and the patients it has helped are forever grateful for them. I have tried to put all of the steps in their manufacturing down, so any laboratory around the world can make them. If you are in need of orthotic devices to help with shock absorption at your feet, shins, knees, hips, or low back, consider this orthotic device. It is the best product for this purpose I have ever seen. Hannaford Orthotic Device before ground into proper shoe fitting size designed off a cast of the foot. What are the Basic Components (in summary)? 1/2" flesh/pink soft plastazote (also called plastazote #1) full length acts like memory foam--never touch that layer with adjustments as it molds to the individual foot. 1/2" white medium plastazote (also called plastazote #2) sulcus length gives durability. After 30 hours of wear the initial compression has taken place, and the shoe fit is better. Barring any problems, the ortho is refurbished in 3 months. If the patient loves the orthotic device (and most do), they are encouraged to get a second pair around 6 months, for ease of refurbishing, and for alternating to save the life of the orthotics. As the weather gets colder, toes can take a beating. Many people also suffer from conditions that make their toes painful in cold weather, or always cold and uncomfortable. HeatMax has their Toasti-Toes Foot Warmer pads that produce enough heat each for up to 7 hours. They definitely are worth a try this winter. They comfortably attach to the inside of your socks so they are against your skin. The best deal is the one to your left. I hope this will help. I want to thank my patient Arielle for her high recommendation of this product. Toasti-Toes which have been removed from Arielle's socks for this photo opt. PS. Have any of my Boston Area followers seen my son Chris and his gal Liz. This photo is from Sunday's blizzard 12-26-10. I love to cover Hannaford Orthotic Devices with leather initially to see the wear patterns, especially correlating the wear patterns to what I see in gait, and comparing right to the left sides. The wear patterns may reveal that the foot needs more padding in certain areas, or where there is more need for pronation or supination support. With the Hannaford Orthotic Device, 30% of the bulk is reduced over the first month as the memory foam molds to the foot. Around 3 or 4 months into wearing the devices, medial and lateral buttresses are applied to the bottom to improve the pronation/supination stability dramatically. I use 1/8 inch grinding rubber for this purpose. (see the post on grinding lifts for ordering of this material). I also change the thinner leather with thicker 1/8 neolon/spenco for better shock absorption while refurbishing. Normally, when using the Hannaford device, a new one is ordered at 3 to 6 months. In this way, the patient can have adjustments made on both pairs at any office visit, and can alternate between the two pairs which saves the life of each pair dramatically. By alternating, when one pair begins to be less supportive, or more painful, or both, compared to the other pair, you will know when it is time to have it refurbished. 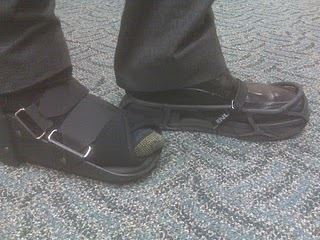 As you can see from previous articles that the Hannaford Orthotic (the best for shock absorption) can be very bulky. Recently, one of my patients Bob, went on a big search and found the New Balance 623 (comes M and W) worked the best. It is a cross trainor type. The variable widths help this immensely. If other patients have found shoes that work well, please email or comment on this post. Hannafords before they have been grinded into better shoe fitting shape. Shock Absorption is needed following the impact (collision) of the foot against the ground. The shock wave that radiates up the leg is approximately equal to your body weight with normal walking, increases as you increase speed or go downhill, and can measure 2 to 5 times body weight with normal running. It is this shock wave that needs to be reduced to help many avoid injury by changes in shoegear, changes in surface, changes in shoe inserts, and custom made shoe devices. The King of all is the Hannaford Device. Hundreds of my patients have benefitted over the last 25 years, and I am hopeful to spread the word on how it is made. 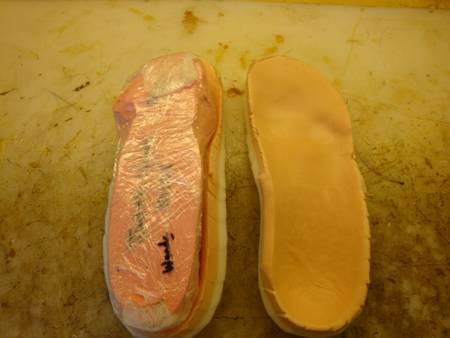 Hannaford Orthotic Devices, developed by Dr David Hannaford while practicing podiatry in Eugene, Oregon, are 2 layers of 1/2" plastazote material vacuum pressed around a mold, and then ground into shape to fit a typical athletic shoe. The layer of plastazote material against the skin is memory foam, soft in nature. The second layer of material is white plastazote, firmer and more durable in nature. Impression Casts are used to make a Hannaford Device. 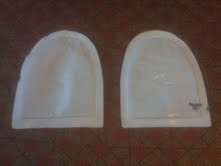 The 2 sheets of plastazote are cut with the memory foam full length and the white, more durable, plastazote cut to sulcus length (just behind the toes). The length of the soft plastazote is approximately 1 and 1/2" longer than the foot and will be trimmed after the molding to fit better. 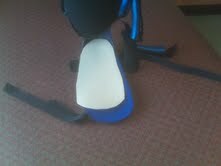 This is how the 2 pieces will be pressed with the softer memory foam against the foot. Before vacuum pressing, both pieces are glued with Barge Cement so they will become like one after the press. Before pressing, the toe area of the mold is covered with a soft material to flatten this part of the press. Without this, the memory foam molds around the toes too much. You need the orthotic to end up longer than the original foot. The 2 pieces are placed in the convention oven heated at 475 deg F. Because the white layer heats up slower than the pink layer, the white layer is placed down on the surface. Within the convention oven, the plastazote material is checked every 20 seconds and removed when the toe area begins to brown. A spatula is used to remove, but it can be handled gently with your hands. Here it is centered over the mold with overlap around both sides and front and heel. You need to get as far forward in the press as possible for the best press. See the memory foam layer is being placed against the foot. Once the press is started, you need to push down from the sides to help the vacuum remove all the air. The press is normally done in 20 minutes/foot. After the press, wrap the mold with plastic wrap tightly for 1 hour to let the material cool completely in the shape of the mold. Once removed from the wrap, mark the front length approximately 1 and 1/2" from the end of the mold, and mark the sides the exact width of the foot. Since I have a video of the grind, I will let that finish this post off. The posterior sleeping splint has been a mainstay for plantar fasciitis and achilles tendinitis sufferers. Since you get benefit any time you wear it more than 20 minutes, many patients use it alot during the day as they sit doing work or eating meals. It is more appropriate to think of it as a rest splint. It puts a gentle stretch on the tissues that shorten in injury. For many patients, it is a vital aspect of their treatment, and for others, simply a possible aid to their healing. Relook at a Youtube video I made introducing this topic. The rest splint below shows the side straps actually cut off to emphasize that they are rarely used, and should be very loose (at least initially). It is hard enough to get used to the splint alone without having to crank up the tension. Many patients complain that they come up in the heel while wearing the splint (you want the heel to sit as deep into the splint as possible). To remedy this situation, I have to add heel lifts under the bladder of the splint. 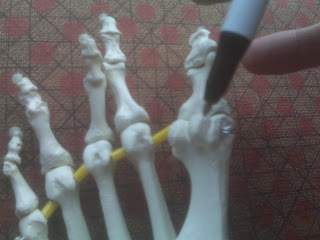 This helps stabilize the heel in the splint. Up to 1 inch of heel lift is needed in some cases. Padding of various amounts is also used when the splint causes too much pressure in the metatarsal areas. I have some patients complain of pain or numbness from this pressure in the fore foot. There are various inserts like Spenco on the market that can also be placed under the bladder to ease the pressure on the fore foot (see the link above). Here is a view outside of my office window of a Christmas Sunset. Merry Christmas and Happy Holidays. I wish all of you Merry Christmas and Happy Holidays and New Year. I hope our office Santa Baby rendition brings a smile to your face as it did to our founder Dr James Garrick. When symptoms are clearly inflammatory, and you are having a hard time reducing the pain level, think about a short course of oral cortisone. This is called a Cortisone Burst, or a Prednisone Burst, since prednisone is one of the most common drugs to use for this purpose. This can also be used when you have chronic, mysterious pain and you are unclear if it is inflammatory. Oral cortisone over an 8 day course in this case will be therapeutic, but also diagnostic. The health care provider will need then to find the source of the inflammation. Remember, cortisone will reduce swelling which is one source of pain. Cortisone will not reduce the pain of broken bones or damaged nerves. I have used oral cortisone the same way for 30 years with good results. Most of the patients have at least temporary, and sometimes quite long lasting, 80-90% pain relief. They are very grateful for some relief. And, in the real world, patients present with the acute problem you are treating them with, and also other pains. The secondary benefit of oral cortisone is the relief it gives to these other areas. I remember a patient with severe plantar fasciitis I was treating with contrast bathing, icing, ibuprofen, physical therapy, etc, to name a few, that got poison oak. The ER doc placed him on lotions, plus an 8 day tapering course of prednisone. Not only did the symptoms of the poison oak resolve, but it completely knocked out the plantar fasciitis. That plantar fasciitis was better after only 3 days on the prednisone, and never returned once the prednisone ended. 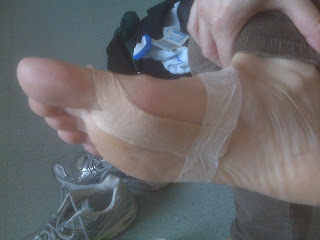 Of course, he had all the other treatments of plantar fasciitis on board (splints, orthotics, taping, stretching, etc.) I kept him icing twice daily for several months longer. You can only give oral cortisone every 6 months. Oral cortisone can give great results if the pain you are treating is inflammatory. But, some patients have little to no pain relief, if there symptoms are not just related to inflammation. I find the patients who get no relief from this drug very unfortunate, but very diagnostic. A negative response like that sends me looking elsewhere for the source of their pain. If you do the math, I give 60 mg for 2 days, then 40 mg for 2 days, then 20 mg for 2 days, and finally, 10 mg for 2 days. It is while taking the 10 mg that the body starts making it's own again. The last 2 days are crucial doses, since the first 6 days have shut off the body's production. Stopping, for any reason, this drug before you complete the full 8 days should only be done on doctor's advice, since it can produce an adrenal crisis (does not sound good!!) I have never had a patient not finish the course. 90 % are very glad that they did it, but most are wired (even very difficult falling to sleep) for the first 4 days. So it is used when appropriate, but I thought it is such an important tool at times, that you should know about it. Since it is a naturally occurring drug, I would say that used correctly it is very safe. Casts for Immobilization: Can They Be Works of Art? Here Kylie proves that Art exists in ankle casts. This is a true work of art. Please send me photos of casts that have been created into wonderful works of art. Dr David Hannaford from San Rafael California revolutionized the orthotic world for patients with shock absorption problems. These are patients with knee arthritis/pain, hip arthritis/pain, stress fractures, heel bruising, and shin splints. Check out my YouTube video on the grinding process. You can also see the general discussion of addressing shock absorption issues on this YouTube video. Any podiatrist, orthotic lab, or pedorthist interested in learning the nuances of manufacturing this device I will be happy to share the steps. Please email me. I will have a full post soon on the entire process. It is a great device for many patients. A Hannaford Device is typically full length and made off a cast of the foot. The top layer of soft plastazote material is a memory foam which molds to the patient's foot. A leather top cover is used since it shows all the stress points and can help in discovering the best modifications if necessary. When using Outer Sole (or midsole) lifts to correct for a short leg, it is very important that the patient feel that they can move freely through their feet as they push off the ground. 1/2 inch outersole lift is tapered at the toes to allow easy roll forward. 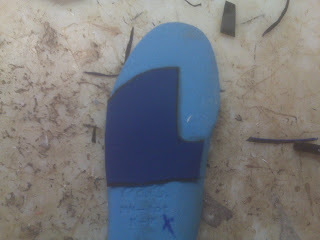 The lift is seen from the back with 1/2 inch applied to the outer sole of the left shoe. Here the ball of the foot area is cut into to allow for bend at the metatarsals smoothly at pushoff. Very important. CT Scan of Big Toe Joint showing 2 normal sized sesamoids under the first metatarsal head. They can be very vulnerable to injury due to their position. Spica Taping to limit dorsiflexion of the big toe joint. Ice or contrast bathing up to 3 times per day to control the swelling. 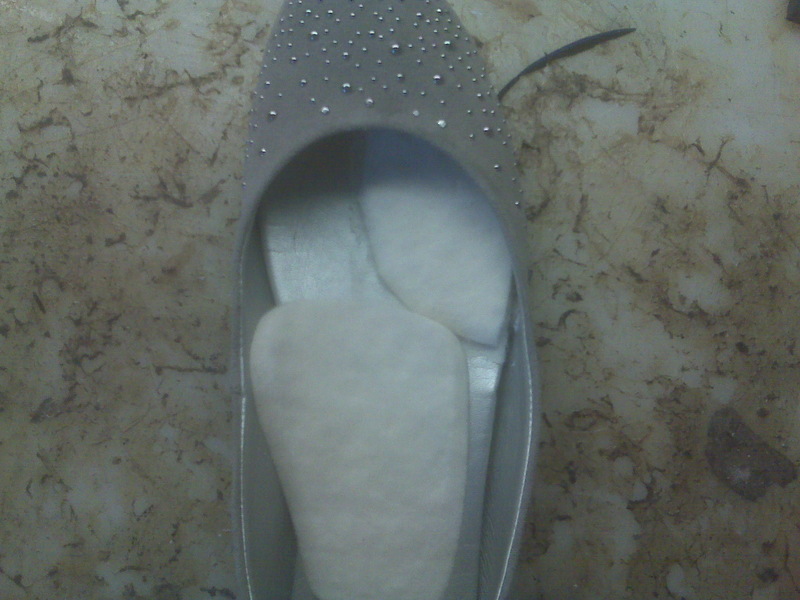 Accommodative padding in all shoegear to protect the sore area. A removable cast to use when needed (need to be able to completely eliminate pain when necessary for several days. A diet with good levels of Calcium (1500mg/day) and Vit D (400 units/day). The 2 videos below show limb dominance to the long left side with walking, and correction of that limb dominance after lifts are placed in the shoe of the short right side. Gait evaluation when treating short leg syndrome is crucial since you must see if the lift therapy is working and correcting the postural problems. When the gait looks worse, or no better, after you have placed 1/4inch or more into a shoe, RED FLAGS should be raised for you may be treating the wrong side, or no leg length problem at all. There you probably need standing xray verification on whether you are correctly attacking the true problem. I had just recently been following your website and other works you have done and decided to email you. It is very rare to find a doctor these days who actually communicate and educate people who are not necessarily their patients. For this alone, I already know you are a different doctor - one that we need more of these days. I decided to write to you because of this. As I have problems in the low back, hip, knee, and ankle, I have been given fragmented diagnosis of my condition and none of which I can put into perspective. I chose to write to you because of your experience with biomechanics hoping that I could get a better idea of what os going on with my body. Forgive me, but my medical history is quite long and I will try to make it as simple as possible for you. I am in the hopes that you would be able to give me a better perspective of what is going on. On Nov 2009, I noticed my right foot did not feel the same. It did not necessarily hurt so I ignored it. On january 2010 I started having right knee pain. My orthopaedic told me I have CMP and sent me to physical therapy. I have been working as a teller for 9 yrs and stand at least 8 hrs a day. My PT told me that my right arch was falling and I needed to get orthotics otherwise I will have hip and back problems. So I started PT in May 2010 and by then I noticed that when I stood up my right knee would always be bending inward and I had to consciously extend it to keep it straight. In August 2010, I started to develop left hip pain and mild left low back pain. I went to a chiropractor who told me that I had LLD in my rt leg and that my left pelvis was anteriorly rotated which was causing a mild low back scoliosis. I got orthotics then and he gave me a heel lift of 5mm. I had mixed feedback with the heel lifts as PT told me I did not need it since my LLD was apparent and not true. I did not wear the heel lifts and I carried on with PT and chiro and I was getting better - knee and hip pain going away with the help of FMLA at work and not having to stand all day. On October 2010 I made the grave mistake of lifting a sofa. An immediate pain shot right through my left groin to my left back and to the right back. For the next few days I was having back pain and oddly enough right groin pain this time (left groin pain went away) and I could not keep my balance when I walked. A few days after as I was walking I felt a rip in my left buttocks down to the right buttocks that made me lose my balance more. I quickly regained myself but then when I started walking again I couldn't walk straight! As I stride my left leg forward, the right leg would go over towards the left leg. This went on for a day after which was causing me a lot of left knee pain that felt like it was being twisted. A few days of limping around with a locked left knee, I started noticing that both my ankles were hurting. My left ankle actually hurts more than the right. For treatment of such a poor diagnosis (not that anybody gave me a straight one) I went to PT again for the left knee this time, and to my podiatrist for my ankle who said i have the sinus tarsi syndrome and gave me steroids as I refused the shots. I went to 2 hip doctors of which one said I may have torn my cartilage and my gait has probably changed and thus the knee and ankle pain but another hip doctor said MRI came back ok and its just a glute strain. I believe I do not have CMP in my right knee. I think that my right knee pain stemmed from my right foot flatenning/pronating. I believe that my left pelvic anterior tilt was because of my right foot that caused my right knee to keep on bending inwards. I dont know for sure if i have LLD. I believe that because of all that has just been mentioned in this paragraph it has unlocked my SI joint causing the low back pain. For the second injury when I lifted the sofa, I believe that there is nothing wrong with my left knee. I think it was compensating for whatever happened to my hip/glutes/low back. For the low back I am sure it is my SI joints as MRI for lumbar came out ok. So right now I am down to my SI joint/ rt hip/glutes in relation to my ankle. Now my left foot has pronated more and my podiatrist said it s because of the cruciate ligament stretched or tore (Im not sure which one). He said if i dont get better with the shots I may have to have that surgery where they put that screw in my ankle which I dont want. I'm afraid that my ankle pain comes from my hip/glutes/SI joint and that if I dont fix them my ankle will never heal. I am not sure what to make out of everything after this point. Dr. Blake, I know you are a busy man and I am only one of the many people that you have to attend to. I am from Las Vegas NV and I wanted to tell you my medical history to see If I am one that you would be able to help if I come see you to your clinic in San Francisco. I think that perhaps a gait analysis will give me more info about my condition and of course with your expertise I am hoping to fully understand and get a right diagnosis so i can have the proper treatment and get better. I am sorry this is such a lengthy letter but I have exhausted all other doctors whom I cant get a straight answer from. Dear Carina, Thank you for emailing me about your condition. I left it in its entirety on the blog because it is an excellent example of when one thing goes wrong, especially our feet, the whole deck of cards can collapse. When I get a history like this, you look at the first symptoms to tell you what is the root cause of the problem. You felt something was wrong with your right foot, probably a collapsing arch. As the arch collapses inward, the knee twists inward, the hip and pelvis get out of alignment, and the first symptoms probably follow the pronation pain syndrome mentioned in my previous blog. I know if you are right handed, and you injure your right side, the left side easily wants to compensate. This would lead to left hip pain from favoring the right. I will assume you are right handed. Even not, enough limping protecting of your right side can lead to a breakdown of the left eventually. After you had orthotics made, did you feel equally supported right to left? 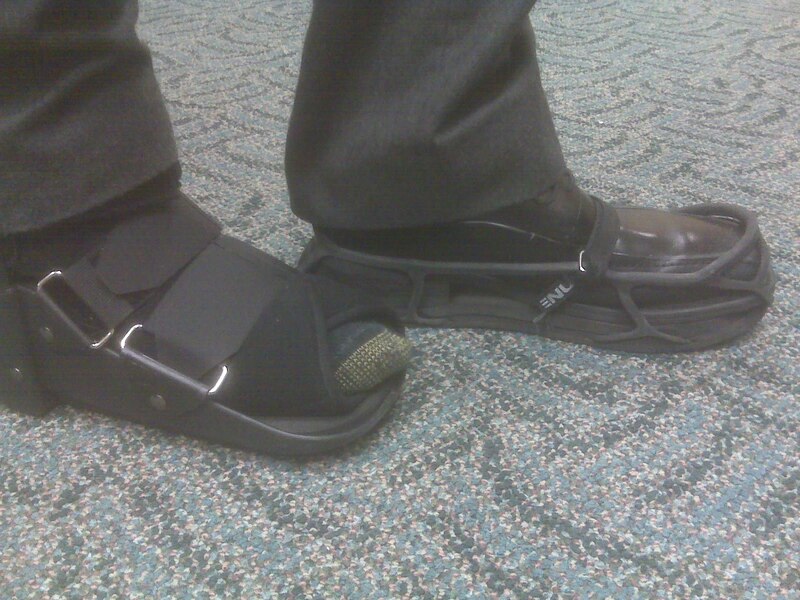 Do you feel that the orthotic devices eliminate all or 95% of your pronation? This I think is crucial to making you well. If you look at the link above and the video on pronation you could email me one of your own with a help from a friend. I would be happy to analyze for you. 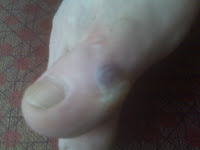 When symptoms arise like this I believe you have to have great orthotics, not just good orthotics. You may be in good orthotics, which control the pronation of your feet 60-70%. But, I would shoot for 95-100% correction for the next year. 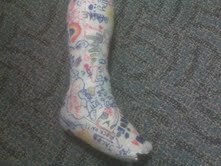 It serves like a cast for the pronation. This can only be analyzed with stable shoes and power lacing. Definitely get great a power lacing. And, only until the orthotics are perfect can you really do the standing eval for leg length difference. Ask your podiatrist if the orthotics completely correct the pronation once you power lace. Ask a good athletic shoe store known for their expertise in running shoes. 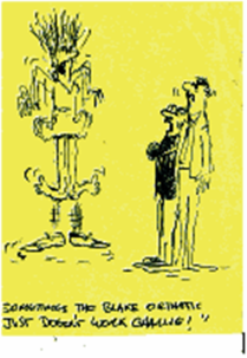 Watch the videos on pronation with a loved one, and have them watch you walk. Once the orthotics are fine, the standing LLD measurement can be taken. Foot Strengthening Exercises: Who Has Lost Their Marbles? This is another of a series of foot strengthening exercises that I am presenting in this blog. Metatarsal Doming/Arcing and Playing The Piano exercises have previously been shown. When you add flatfooted balancing exercise (separate post) and Inversion/Eversion Thera Band exercises, you can develop a good program to strengthen your feet. Remember to do foot strengthening exercises in the evening when tiring your feet will not matter. You can start these exercises daily to make them a habit, but three days per week will gradually give you stronger feet. See the links below to the other posts on foot strengthening. My name is Kathy and on a whim I’m hoping you might be able to offer me some hope. I was diagnosed with a sesamoid fracture on 9/22/10. Acute onset of pain (for no particular reason) preceded by a few months of achy in ball of left foot. I believe it’s the tibial or sesamoid closer to other toes. My first xray indicated a small crack in the bone smack in the middle of it, it reached the center...so wasn’t split totally in two pieces. I have been in a walking cam boot deal since. My xray follow up on 11/22 showed the same crack only slightly wider and maybe fractionally deeper. Pain DOES feel better but still unable to fully bend the toe (as in taking a normal step with full weight). My Dr. looked very confused by the xray comparisons. I live in a semi remote area. Podiatrist not a sports med guy. My insurance will only cover folks in the vicinity, but really I can’t find ANY podiatrist anywhere who can seem to give me any kind of hope for this hideous thing. I’m 38 have surfed avidly for 10 years, done yoga for 15+years, and snowboarded for almost 20. No heal wearing ever but lots of flip flop wearing. Is this bone dead? Will it ever heal? I would love any help or advise you could offer. I am going crazy, lol. 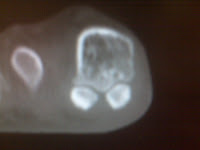 Here is a broken fibular sesamoid that shattered and needed to come out next to a normal looking tibial sesamoid. The sesamoid help protect the first metatarsal and, like the knee cap, function to separate the tendon to the big toe away from the bone thus increasing its lever arm of more greater power. Here is an MRI showing a bipartite tibial sesamoid (a congenital abnormality often misdiagnosed as a fracture), and a fractured fibular sesamoid (see the fracture lines). 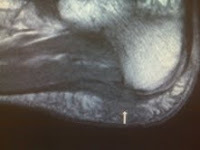 The MRI slices are just entering the bottom of the foot so you see parts of the other toes and metatarsals. The fibular sesamoid on Kathy's xrays probably look like that. I will have her email a photo. Hope Kathy can learn some form of spica taping (my best You Tube video). Kathy, thanks for the email. A fractured sesamoid takes 3 to 6 months to heal so you are probably doing fine. The removable cast you are in should be giving you total painfree function, and if not, can be modified with various pads. But it is a must that you are in that removable cast for 2 months painfree before you begin to wean out of the boot. 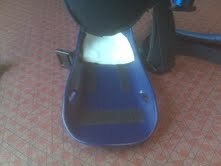 Here is an insert with a dancer's pad to float the sesamoid that can be used in the removable boot also. Inside the boot you can also do the Kinesio spica taping to help, and you may need the Evenup for the other side if your back starts getting out of whack. Injured foot with Evenup on the other side to level the hips and base of the spine. Kathy, xrays can not be used to follow the progress of sesamoid fractures, except as a comparison 6 months down the line. Xrays actually look worse for 2 or 3 months because the healing process brings with it alot of fluid into the fracture site. This gives the fracture site a more washed out look for awhile during very healing, and is constantly being misinterpreted as poor healing. Palpation of the bone will also be sore for several years, so not a good indication of healing or lack of it. MRIs give very useful information and can be followed in 3 months. Before MRIs we just followed the patients symptoms, and that normally worked well. Truly function is the best indicator of overall healing. Put your foot on an ice pack 3 times daily for 10 minutes to reduce inflammation. You want to have all some symptoms from the break and none from the surrounding inflammation. Avoid anti-inflammatory meds since they can slow down bone healing. Talk to your podiatrist about getting a bone stimulator from Smith and Nephew called Exogen. You place on your foot 20 minutes twice daily. The bone stim company will work with you insurance company so you know what you have to pay beforehand. The bone stim will probably for the next 6 months. Discuss you Calcium and Vit D levels/intake with your internist to make sure they are not a problem. I would consider a bone density screen, and especially if you have any family history of osteoporosis. Get your Vit D 25 levels. Make sure you can make that removable boot into a painfree environment. All podiatrists know that one well. Learn how to do spica taping as shown on the video above. Get a baseline MRI. Plan on another one 3 or 4 months later. Have a PT show you some simple strengthening exercises to start doing now. Everyday you are losing strength, and it will take longer to get better the weaker your foot is, but you can not produce pain. My blog has ample exercises that you can review with the physical therapist including playing the piano, metatarsal doming, flat footed balancing, and inversion/eversion resistance band exercises. Read my blog post on good and bad pain and become good at this analysis.